More than 70 years after the end of World War II, a small South American country erected its first Holocaust memorial. Over 100 Jewish names were engraved on stone in Paramaribo, the capital of Suriname, in March of this year — establishing the first monument to local Holocaust victims in the Caribbean region. “Even though they were in the northern part of South America, the impact was profound — 105 Jews got caught in the wrong place at the wrong time,” said Jacob Steinberg, a gold mine professional who was instrumental in raising the funds for the monument. Suriname lost almost a fifth of its Jewish population during the Holocaust, according to Steinberg. Suriname was then a Dutch colony known as Dutch Guiana, and because there were no universities there, young people often went to Holland to pursue their education or advance their careers, Steinberg explained. Unknowingly, some of them found themselves stuck in the Nazi death machine. One of the victims was Stroobach’s great uncle, Abraham Samuel Fernandes, who was born in Suriname but went to work in Holland before the war. He joined the Dutch resistance, but he was caught and sent to prison, where he was tortured and killed at age 34. “When they found out he was Jewish, he got the worst treatment,” Stroobach said. She said her mother and grandmother survived the war by living in a non-Jewish neighborhood of Amsterdam and almost never leaving the house. “My mother’s family refused to wear the star, they did not register, and I think that’s what saved them in the end,” Stroobach said. 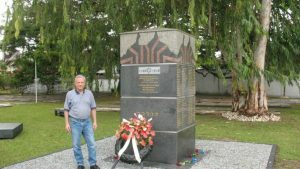 For her part, Stroobach said “it’s absolutely wonderful” that a monument to Holocaust victims was finally erected in Suriname. “Hitler said no one will remember. We have to prove Hitler wrong because we’ll always remember,” she said. In addition to the names of the 105 Holocaust victims, the monument includes their dates of birth and death, and the names of the Nazi camps where their lives ended. Most were murdered in Auschwitz, Steinberg said. In the course of his research, Steinberg passed on the names of 15 forgotten Surinamese Holocaust victims to the Yad Vashem museum in Israel. Suriname’s Sephardic Jewish community dates back to the 17th century. Portuguese and Spanish Jews moved to the area because they were allowed to own land and were given the freedom to form their own militia. They started out as planters, but later acquired sugarcane plantations and owned slaves, Steinberg said. They established communities with names like Torarica, the Jewish Savannah, and Jerusalem on the River. “The first autonomous Jewish state, you can say, was in Suriname in the 17th century,” said Steinberg who has done extensive research on the history of the community. He said visitors to the country can still see 17th century Jewish gravestones and synagogues in the jungle. Jews were so influential in Suriname that the country’s dialect, known as Sranan Tongo, includes words borrowed from Yiddish and Hebrew. For example, “treif” in Sranan Tongo means “bad food,” Steinberg said. While their population numbered about 2,000 in the 18th century, Jews began to leave Suriname after the collapse of the plantation economy. Even more left after Suriname became independent from Holland in 1975, Steinberg said. Only about 100 Jews and one synagogue remain in the country today, said Steinberg. Many are mixed and assimilated with non-Jews, he added. So much so, that a representative from the local mosque, which is right next to the synagogue, attended the dedication of the Holocaust monument. Suriname was not the only Caribbean nation where the Jewish community was affected by the Holocaust. At least 52 more Jews from the Caribbean and its extended basin were murdered in the Nazi concentration camps, including 23 people from Mexico, 19 from Cuba, 15 from Curacao, two from the Dominican Republic, and one person each from Trinidad and Tobago, Saint Thomas, The Virgin Islands, Guatemala, El Salvador, Nicaragua, and Guadeloupe, according to a new book by Diana Cooper-Clark. The Jamaican author, who is also a professor at York University in Canada, published a book this year about the Jewish community in Jamaica, entitled “Dreams of Re-Creation in Jamaica.” In it, she argues that we must not forget that Jews from the Caribbean were also affected by WWII. “People don’t know that Caribbean Jews were murdered in the Holocaust,” Cooper-Clark said. She noted that in fact “not one” of the Holocaust experts she interviewed for her book knew that Jews from that part of the world were also killed in the concentration camps. For many years, Eva Unterman was silent about the horrors she endured in Nazi concentration camps in World War II, where millions of her fellow Jews were exterminated. Then, in 1978, a public school teacher asked if she would tell her story to his students. By the 1990s, she was deeply involved in Holocaust education, and since 1998, she has directed Tulsa’s annual interfaith Yom Hashoah Holocaust commemoration, which last year drew more than 1,000 people to B’nai Emunah synagogue. This year’s Yom Hashoah, to be held May 1 at Temple Israel, will be her last as director. Now in her 80s, Unterman is turning the project over to Suzie Bogle, the new director of Holocaust education for the Jewish Federation of Tulsa. Unterman will remain chairwoman of the Council for Holocaust Education but will not organize the annual event. When Dov Noy would lecture, often without notes, he would look upwards and seemingly draw his inspiration from the upper spheres. But Noy, who was expert in the folklore of numerous Jewish “tribes,” including Ashkenazim, Sephardim and Middle Eastern Jews, developed his profound knowledge from earthbound ethnography and research. 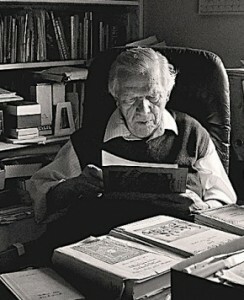 Noy contributed most significantly to the collection and analysis of Jewish folk literature, both written and oral. The Hebrew terms ba’al peh (oral) and biksav (written) are usually applied to the modes of transmission of the Torah. Noy’s extensive and successful efforts to record the oral folktales of the Jews resulted in a folk Torah, if you will, one that revealed the inner heart and soul of diasporic communities throughout the world. NEW YORK — NEW YORK (AP) — Chana Mlotek (KHAH’-nuh MLAH’-tehk), a noted archivist of Yiddish folk music, has died at age 91. 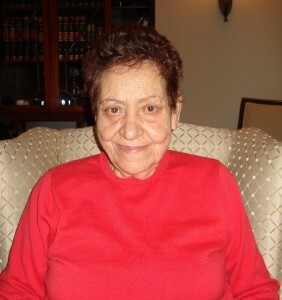 Her son Zalmen says she died of cancer Monday at her Bronx home. Mlotek was an impassioned collector of Yiddish theater songs and folk music from Europe’s historic Jewish communities. The couple wrote a newspaper column called “Pearls of Yiddish Poetry” for the Yiddish edition of The Forward for more than 43 years. She studied Yiddish folklore at UCLA. 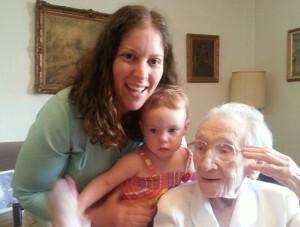 She worked for the YIVO Institute for Jewish Research for 65 years, almost to her death. Seeing her diploma and 1940 report card aroused fond and difficult memories for Toronto resident Sara Tivoli Cohen (Hanna Canzio). BALTIMORE (JTA) – Sara Tivoli Cohen has thought occasionally over the years about the junior high and high school in Greece that she attended, not realizing she had yet to receive her diploma from the Umberto No. 1 Italian School in Salonika. Now the 84-year-old Toronto resident is checking the mail awaiting its arrival. Suri Greenberg, the daughter of the late Toronto couple who had adopted Cohen’s orphaned sister Esther, found Sara Tivoli on a list of 157 Jewish students who had never been awarded their diplomas because of World War II. The list accompanied a recent “Seeking Kin” column on the Salonika school. NEW YORK (JTA) — Gisela Kohn Dollinger tricked death twice. Soon after Kristallnacht, when she was 36, Dollinger persuaded the Gestapo to release her husband, rather than send him to a concentration camp, and the two of them fled Austria for Shanghai, where she almost died of typhus. After that, death seemed to forget all about her — until last week, when Dollinger passed away peacefully at Manhattan’s Beth Israel Hospital. She was 111 years old. Dollinger’s passing came just weeks after Alice Herz-Sommer, a pianist and the subject of an Oscar-winning documentary who was believed to be the world’s oldest Holocaust survivor, died at the comparatively young age of 110. Known by her friends and family as “Gisa,” Dollinger was the youngest of 15 children. She was born in Baden-be-Wien, a Vienna suburb, on Aug. 30, 1902, according to her relatives. Canada has allocated $800,000 to preserve the testimonies of Holocaust survivors. The funding from the federal Citizenship and Immigration department will go to four Jewish organizations in Canada to gather video testimony from survivors. World Jewish Congress president Ronald S. Lauder has asked Conference on Jewish Material Claims Against Germany chairman Julius Berman and executive vice president Gregory Schneider to respond to allegations of covering up fraud, according to The Jerusalem Post. According to the allegations, senior conference executives covered up a 2001 communiqué exposing ongoing fraud within their organization that ultimately cost $57 million. Both Lauder and WJC secretary- general Michael Schneider sit on the board of directors of the Claims Conference, which works to secure restitution from the German government for Holocaust survivors. Lauder made the request in a letter to Berman and Schneider on Friday. The task force, Lauder wrote, is to be chaired by Michael Schneider and include WJC general counsel Menachem Rosensaft.